Extension set for Window Vac 26331110 https://www.kaercher.com/ie/accessory/extension-set-for-window-vac-26331110.html The Kärcher Window Vac extension pole is compatible with all models of Window Vac except the WV1, allowing you to clean high windows and hard to reach areas. The Kärcher Window Vac extension pole is compatible with all models of Window Vac except the WV1, allowing you to clean high windows and hard to reach areas. 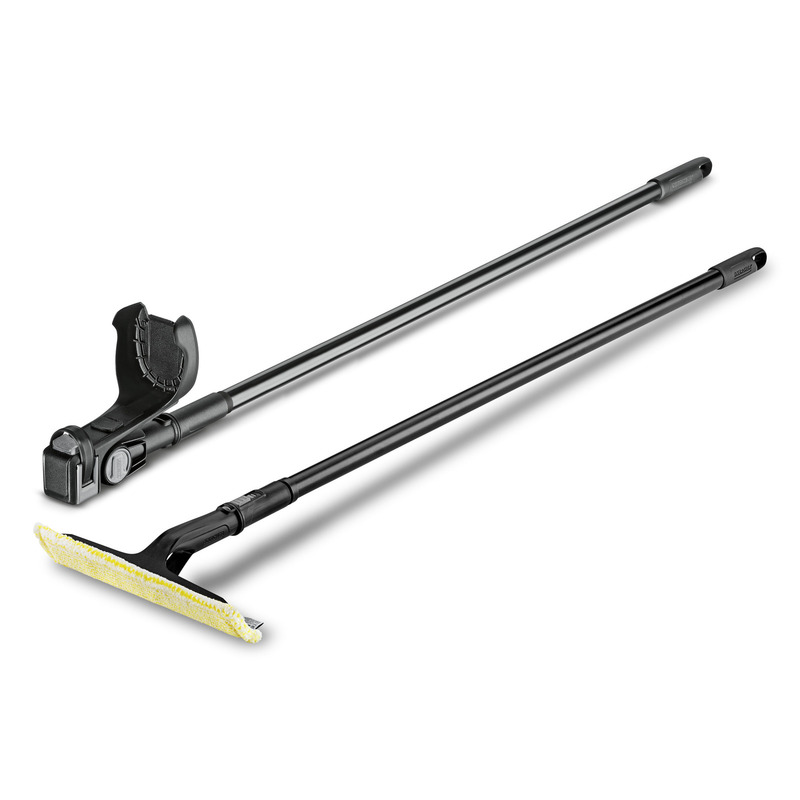 The Kärcher Window Vac extension pole is compatible with all models of Window Vac except the WV1, allowing you to clean high windows and hard to reach areas. Extendable up to 2m, the window vac extension pole comes with a vario joint allowing you to clean at the correct angle. The extension pole kit comes with an additional pole you attach the microfibre cleaning cloth to, allowing you to wipe your windows down with detergent before you vacuum up the dirty water with your window vac attached to the extension pole. This means high windows, conservatory ceilings and hard to reach areas can be easily cleaned and dried, steak free. The lance can be extended to a maximum length of 2 metres. Extension set for Window Vac is rated 4.0 out of 5 by 24. Rated 5 out of 5 by Marge from Extension set Just what I wanted, don’t have too climb any more step ladders. Rated 5 out of 5 by Bobw from Armexte sion Glad I bought this as great for cleaning conservatory roof. Rated 5 out of 5 by Chunky63 from Should have bought years ago! Having replaced the conservatory roof five years ago with self-cleaning glass to save me cleaning the roof once a year, I ignored the need to clean the inside. Having used a Karcher window vac for many years and been delighted with the results, I have finally bought the extension set to clean the roof inside and I am delighted with the result, it took a bit of practice but having mastered the technique my wife is very pleased with the result! Rated 4 out of 5 by Grey Moose from Extension set for window vac Unfortunately it was not long enough to clean the solar panels on my bungalow roof.